Happy New Year! 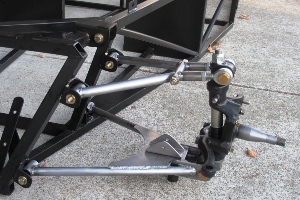 All the pieces of our Locost A-arms have been joined into functional automotive units, and they look great. There was quite a bit of welding involved, but fortunately it wasn't done by us. It was done by someone with actual experience using a tungsten electrode and a bottle of argon gas. We got to watch the process, and I personally gained valuable experience with using my new self-darkening helmet, which didn't actually require me to do anything but it was good experience nonetheless. We felt like we were helping. Before any carefully-crafted A-arm pieces were melted, we ran a test on scrap tubes. This produced a beautiful weld, which we immediately cut apart with a chop saw. 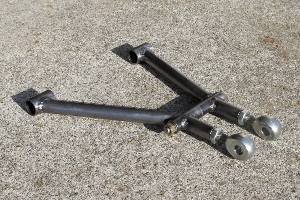 The insides of the joint looked perfect to me, so we loaded up the jig with chunks of metal, and made ourselves a Locost upper control arm. Everything was tacked on top in the jig, then removed to tack the bottom, and finally fully welded. The big moment came when the A-arm was dropped back into the jig and it fit like a glove. Even better, no parts of the wooden jig went up in flames. 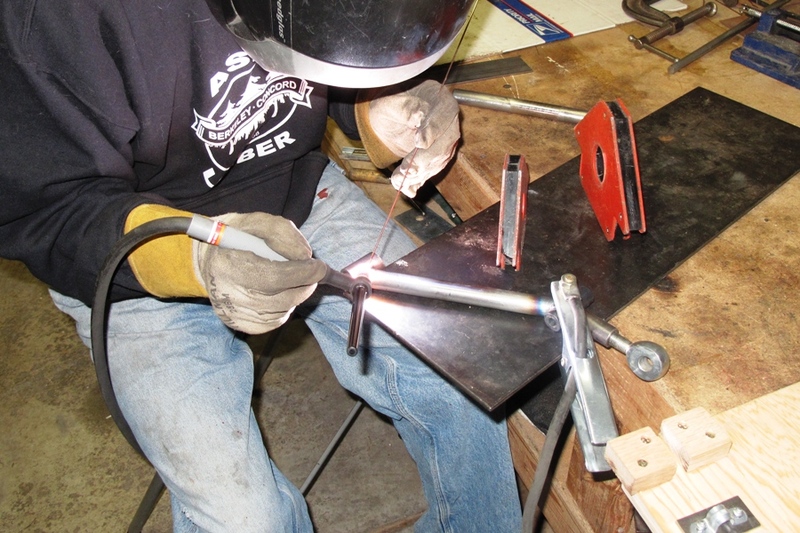 The lower A-arms were easier still, both easier to tack in the jig, and easier to weld once they were out of the jig. Or at least that's the way it looked from the observation deck. After tacking both sides of every joint, then fully welding everything, the lower A-arms needed a little coaxing to go back into the jig. 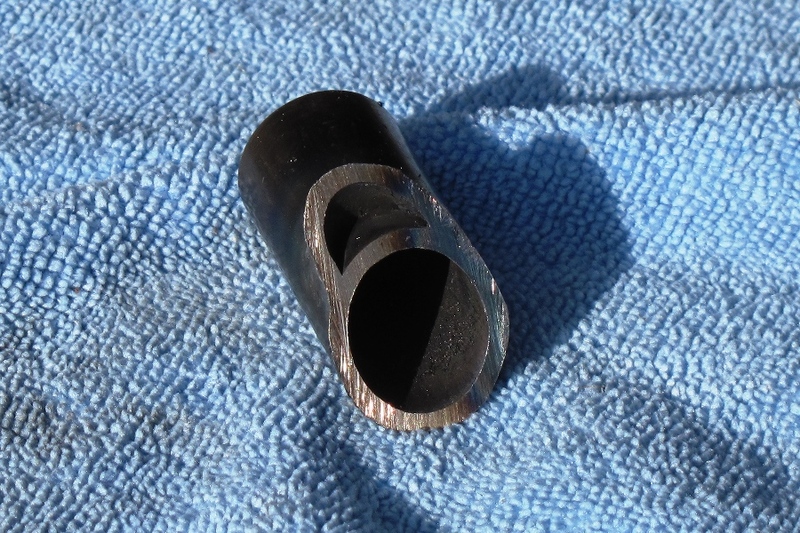 But they did go back, and all of the bushing tubes and brackets were still in perfect alignment. Amazing. The lower control arm jig got a little toastier than the UCA jig did, but it still looks like it should be good for a couple more rounds, if we ever need it. When the welding was done, both upper and lower A-arms looked exactly like our drawings. Almost unbelievable, and very encouraging. The welds look excellent. It's easy to see why TIG welding is preferred over MIG. Beads are neat and uniform, with no spatter, and you can vary the heat with a foot pedal so the welded joint looks the same start to finish. This guy was a total pro. We couldn't have done this good in a million years. After we got home we assembled the left side of the front suspension on our mock frame. The distance between the upper A-arm rod-eyes turned out to be just about perfect. With the trunion bolt fully tightened, the space between the two cross-tube pieces was 0.027", less than 1/32". It only took about 5 foot-lbs of torque on the 3/8" bolt that runs through the cross-tube to eliminate the gap, but in the final assembly we'll probably use a .025" shim between the two halves of the cross-tube, if only to eliminate any stress on the rod-eye threads. On the lower A-arm, the distance between the trunion brackets turned out to be within about 0.001" of perfect. We couldn't quite push the trunion in by hand, but we were able to lever it into position with minimal effort using only a screwdriver. After torquing the trunion bolt to 50 ft-lbs, the bottom of the kingpin still rotated freely and solidly in the bracket with absolutley zero play. Just excellent. The old dial caliper really paid off big on this one, as did all of that jig-building experience. Plus a little dumb luck. Or maybe more than a little. It's a real milestone having the A-arms all done. And actually a little strange. So much focus over the last several months on the design and construction of these pieces. We probably spent over a hundred hours staring at the plans on the computer, looking for ways to tweak the design, changing this dimension and that, moving pieces a quarter inch here and an eigth of an inch there. Hundreds of hours. And now we can put all those plans away. No more changes. 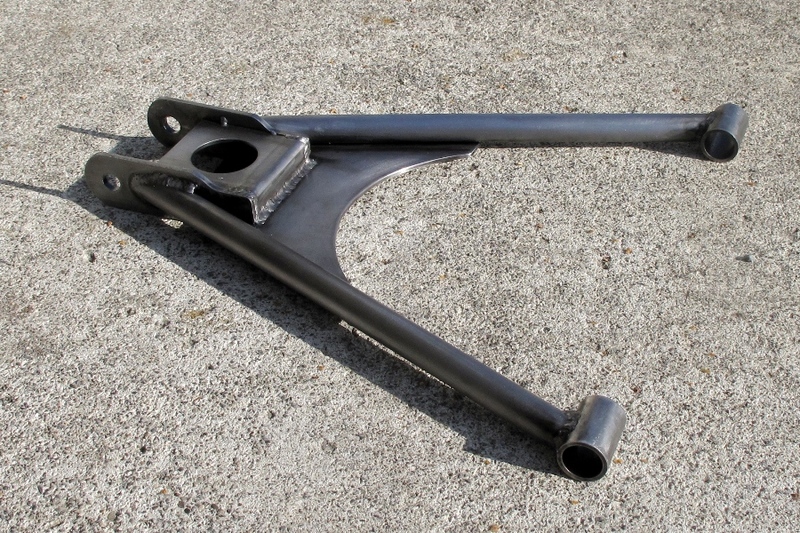 Now, all the frame tubes have been cut and we've started on the rear suspension pieces, which are far less complex than the A-arms, or so we've been led to believe. We want to get as much done as we can before the donor arrives, which should be sometime in the next two weeks.